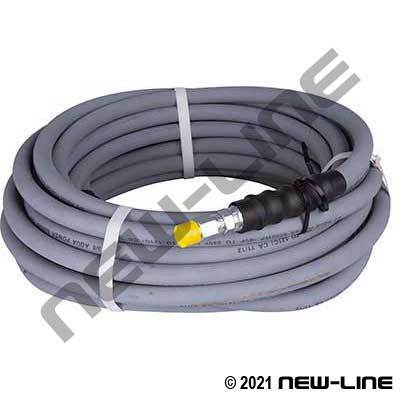 A712 is a rugged two-wire braid pressure washer hose designed for working pressures up to 6000 psi and intermittent temperatures up to +121°C (250°F, for higher temperatures refer to our NL720 Whitewater Steam Cleaner). Its tube and cover are specifically compounded to resist cleaning chemicals that can dry out hydraulic hoses and cause premature failure. Its cover is resistant to heat, abrasion, and limited contact to oil. Note: Only use quick connects with the proper PSI rating for application.